An altogether happier boat all round today. Hi all. The generator was repaired late last night. There is a little gizmo inside called an impeller. It looks like the wheel on a water mill and it pushes cold sea water around to cool things. It was replaced 10 days ago in Panama and had fallen to bits causing the generator to overheat and cut out. It should have lasted about a year . Fortunately we have several spares for it. The other happy news was that our attempts to get the sails up correctly today were much smoother and as a result we have made a much better mileage. We plan on about 120 miles every 24 hours. As I write, we have approximately 350 nautical miles left to run to the anchorage in the Galapagos. We need to speed up a bit. That is about 3 days and it just got dark so we want to get in while it is light , otherwise we hang about offshore until first light. The third piece of really good news today was that we got the water maker going , again after a couple of teething problems. We had gotten down to 580 litres from a thousand when we set off. Running it today for two hours created 90 litres so in a few days we should be back up to nearly a full tank and more normal washing can resume. The temperature today was 33C in the shade. 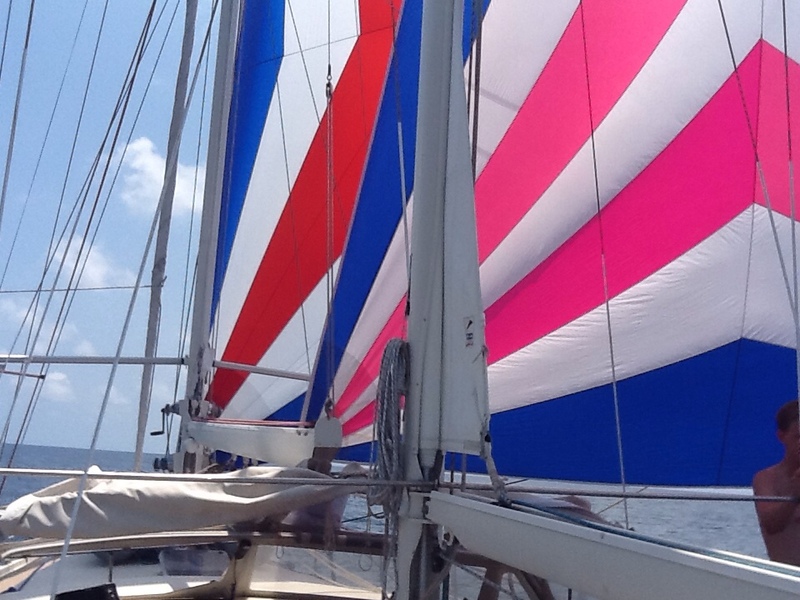 Without the sailing breeze it is very uncomfortable. I managed to get mildly sunburnt a couple of days ago so was wearing long pants and a long sleeved shirt all of today. The winds are really light force 3 or 4 at best. The sea is calm and there are virtually no other boats around. We have seen 4 since leaving . The Pacific Ocean is a very big place. « Little things that are sent to try us!